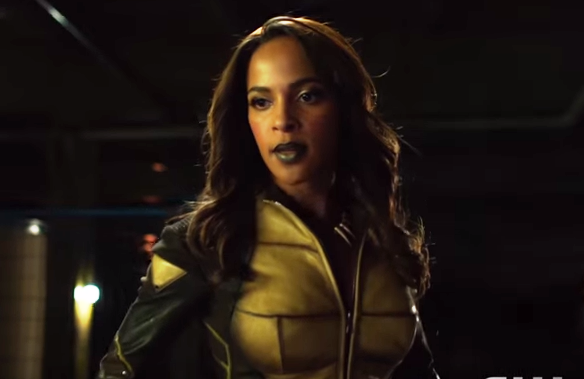 At the end of Wednesday's 'Arrow' episode we got a preview of next week's installment, "Taken," and our first look of guest star Megalyn Echikunwoke as the superheroine Vixen. When Ollie and the gang need help taking down Damian Darhk, they call in some back-up from an old ally. Echikunwoke provided the voice of Mari McCabe/Vixen for the animated web series, 'Vixen,' a 30-minute episode rationed in 3-5 minute vignettes on CW's online channel CW Seed, and now she's doing the live-action duties. She fights crime with the aid of the Tantu Totem that allows her to wield the powers of the animal kingdom. What we know for sure is that the animated 'Vixen' will back for a second season on CW Seed. You can catch Echikunwoke in person next Wednesday on 'Arrow' at 8 p.m on the CW. See the preview below. VIXEN JOINS TEAM ARROW – Oliver (Stephen Amell) realizes he needs help battling Darhk (guest star Neal McDonough) so he calls in an old friend – Vixen (guest star Megalyn E.K.). Using her magical ability to summon animal powers, Vixen gets a lock on Darhk’s location and the team goes to war. Meanwhile, Thea (Willa Holland) has a heart-to-heart talk with Malcolm (John Barrowman). Gregory Smith directed the episode with story by Marc Guggenheim and teleplay by Keto Shimizu & Brian Ford Sullivan (#415).